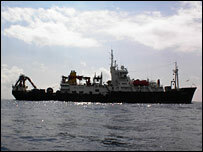 Scientists have been sailing across the Atlantic in a bid to track down sand from the Sahara Desert. The team is trying to find out how the dust is affecting marine biology and, in turn, the ocean's ability to soak up the greenhouse gas carbon dioxide. The researchers encountered two large sand storms during their cruise and recorded footage of their dust-drenched experience for the BBC News website. They followed the sand with the help of satellite images and wind forecasts. 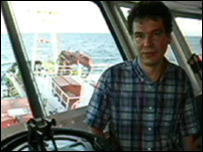 Eric Achterberg, principal scientist for the Natural Environment Research Council (Nerc) funded Solas (Surface Ocean Lower Atmosphere Study) expedition, said he was relieved to have encountered dust storms during the one-month cruise. Another expedition that took place two years ago had failed to find any Saharan sand, he said. He told the BBC: "We encountered two dust storms: one lasted for about three days, the other was a big one that lasted for about four to five days. "We were on top of the ship, you could just see it coming - there was a wall of dust coming towards us and it got very hazy after that. The ship was covered in dust - it was just fantastic. "The dust from this one went all the way to south-west England; we heard reports that in Plymouth there was Saharan dust on cars." Each year, about 1,700 million tonnes of dust are produced by deserts around the world and about one third of this falls into the oceans. The North Atlantic receives the most dust thanks to its proximity to the Sahara Desert. This sprinkling of sand can be critical for marine life in the area. Dr Achterberg, who is from the National Oceanography Centre, Southampton, explained: "The dust releases nutrients to the ocean." The sand particles contain nitrogen, phosphorous and iron, which help to fuel the growth of microscopic plants. "If these organisms grow, they take up more carbon dioxide and remove it from the atmosphere," he said. "If we understand how the dust functions here, we will have a better idea of how the ecosystem in the North Atlantic takes up carbon dioxide, how quickly it takes it up and how this changes over time." The international team of 28 scientists and technicians set off from Tenerife on 5 January aboard UK research ship RSS Discovery and headed towards the west coast of Africa to hunt for Saharan sand storms in the tropical and sub-tropical Atlantic Ocean. 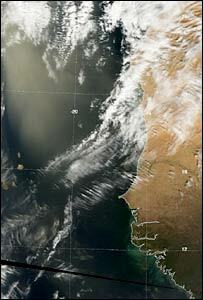 Dust storms are most common at sea during winter, and the scientists were able to locate where they might occur by using satellite images provided by Neodaas (Nerc Earth Observation Data Acquisition and Analysis Service), tracing wind patterns as they came off of the Sahara and computer model predictions. Each time they encountered a dust storm, a range of scientific experiments would commence to find out how the Saharan sand was influencing the ocean's chemistry and biology. Early results from the experiments suggest that the sand was affecting the growth of the nitrogen-fixing bacterial organism Trichodesmium. Dr Achterberg said: "It is clear these became more abundant during the dust storm. "These organisms require a lot of iron, which is supplied by the dust." The data gained from the trip will be analysed back on land over the coming months. The ultimate aim of the expedition, said Dr Achterberg, was to look at the dynamic relationship between dust, marine organisms and carbon dioxide absorption. As well as increasing levels of carbon dioxide in the atmosphere, climate change was also affecting deserts such as the Sahara and the amounts of nutrient-containing sand that they deposit in the seas and elsewhere, Dr Achterberg explained. A recent report suggests that increases in rainfall levels could make deserts greener, while other studies support the idea that they will grow in size in some regions - either way the amount of sand falling into the oceans around the world could change. "And we can do this by collecting dust, looking at its chemistry, looking at its biology. Our project is the first real look at how dust is affecting our oceans."